Katie had been talking about it for days and last week, the day finally arrived. On Monday, I’ll get my brand new ballet costume. It will be blue…light blue…that’s my favorite color. 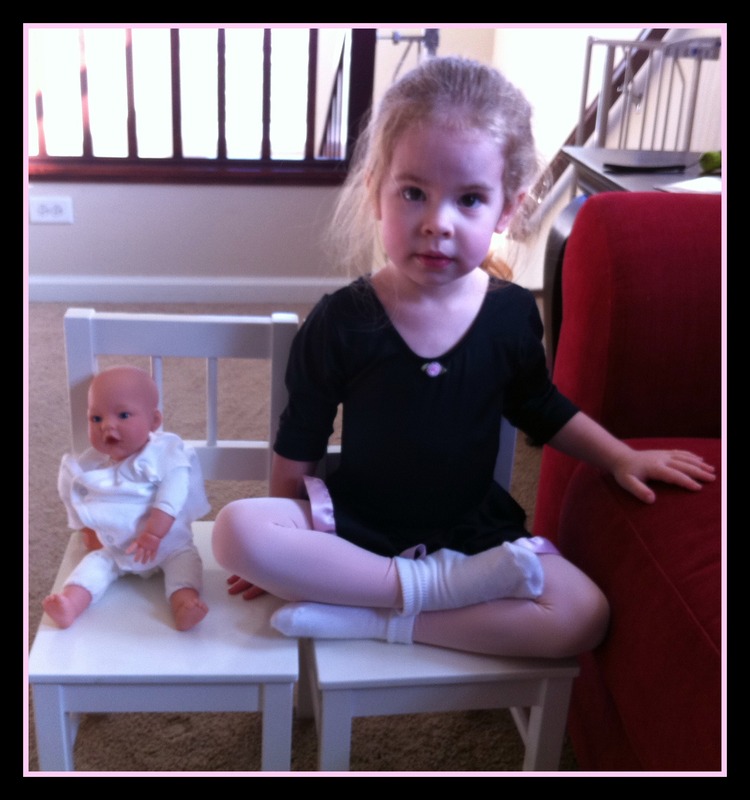 My sweet girl, somehow old enough to be taking part in her first ballet recital. Craig took the day off so that we could both be there when she saw her costume for the first time. These sweet little girls were to try on their new costumes and do a run through of their dance. Our anticipation of her joy kept us up the night before. We laid there in the dark, envisioning her happy face, marveling at the thought that she is nearly four years old. The first part of class went so well…she kept waving to us, her smile easily reaching across the room and into our hearts. When the time came for her teacher to hand out the costumes, we were invited to join her, to help her put it on. This is the wrong costume…I want the other light blue one…I don’t like this one. Somehow, this costume paled in comparison to the one that she built up in her mind. Her face started to crumble…tears welled in the inner corner of her eyes, threatening to fall over her still-baby cheeks at any moment. We tried to re-frame the costume for her, pointing out the lovely trim, the pale blue grosgrain ribbons, the layers of white tulle, as we helped her get dressed. As the other girls ran toward their teacher for a group photo, Katie refused to join them. She stood, panicked, beseeching me to take off her costume, her grip on my hand stronger than I’ve ever felt. I don’t like it…please take it off, Mommy. In those few moments, I was frozen in that space between…between doing what’s best for my child in the moment and what’s best for her in the long run. I wanted to undress her and scoop her up…to reassure her that I hear her and that she matters. That she can confide in me and I will always listen. That she has a voice. That she can trust me. But instead, I held firm, encouraging her at first, then pushing her gently, then telling her that she had to join them for at least a few minutes. I walked her over to join her peers for the run through of their dance, reassuring her the whole way. But, Mommy, I don’t want to…I need a big hug. With one last hug, I turned and walked away…back to my spot with Craig at the side of the room and watched her through my own tears. She locked eyes with me, then Craig, and went through the motions, crying all the while. When the dance was over, we enveloped her in our hugs and soothed her with our love. We congratulated her on doing what she needed to do, even though it was difficult. It still feels like someone is sitting on my chest when I think of it. I don’t know how to find that perfect space between offering her a safe place to land and helping her to find wings. I want to be both. She deserves for me to be both. Yes, it is and you did exactly that for her. Finding that place? Will always be hard…I'm not sure if we ever really find it, to tell you the truth. Because each time I've had to play the hard card, encourage them to do what's right and not what they really want to do, I doubt myself. But by having her go and be a part of the group, do what she was there to do, and then scoop her up afterwards, you did her a big favor in the long run. You modeled following through and being there for her "team". And afterwards? You modeled love. 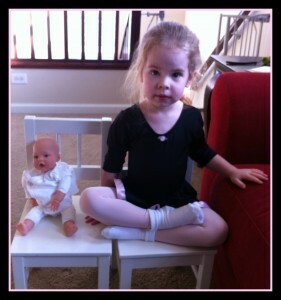 I will tell you one day about Kelli's gymnastics experience…..very much like this. Hugs to you…you are such a good mom! you did the right thing. gosh how I remember those recitals, both terrifying and so exciting. I bet it wasn't even about the costume. she'd built it up so big that when it was real, it got scary. but the next time won't be so bad. I think this is the challenge that every parent has. I know I do. Oh, poor Katie! I was that shy child, and I know my mother often wondered how to strike a similar balance. At 2, my own daughter is very much a watcher, and I find myself contemplating the same thing. And what a beautiful post. I've straddled that as well. It's such a balance between listening and teaching follow-through. You just hate to see your kid upset….but yet…. That is so hard, and I just know I will have many, many moments like that with my girl. I don't know where that elusive balance is, but I absolutely know that you (and Craig) are a wonderful mom (and dad) and that both of your kids will never, ever feel unloved. You were there the whole time and after, and that is what matters. You did everything right. Parent is so terribly hard. But you did a good job. I think you did that by walking her over and offering hugs. It is so hard when things don't meet expectations. I have to agree with everyone, but I love the way Sherri said it. You helped her learn that you don't let your team down, but after you modeled love and reassurance and support. I don't look forward to these situations. I know already Eddie will be a team sport kind of kid…it's obvious from his love of playing with other kids and of games. I wasn't a team person. I was always afraid. I hope to have the courage to love and encourage the way you do. wow, I read this very early this morning, when I was up and my house wasn't yet. I was in theshower when Gio came in, soaked from one end of himself to the other, he wanted new pj's, he wanted me to get out of the shower and change that diaper…and he would not stop crying…and I immediately thought of this story. How would I teach him the value of patience and doing things himself and see let him see that I saw him, that I understood how awful it was to be pee soaked, along with his favorite blanket. You don't even know how much you helped me this morning with this, not 15 minutes after I read it, I knew that I could be a mom and a mother. I needed to be both….and your post helped me do that. THANK YOU. thanks for sharing this, for allowing me to see other moms making these decisions, struggling with them but finding that balance through the tears. Oh my. I can't even imagine how hard that must have been. As you write the words, I can picture my husband and I in the same room, frozen by not knowing what to do. How great that not only did you do what was best for Katie but you did it together. Without having a conversation about it, you two just "did." That's how you know it was right. It's so hard when you love them. Having to be a teacher too is just brutal sometimes. I'm not sure if that space between exists. If it does, it is very hard to find. I think the way you handled the situation pushed her in the right direction to find her wings, but still showed that she has a safe place to land with you and Craig. You did the right thing. It's hard to teach commitment. One time, my daughter wanted to quit a team she had joined because she wasn't getting enough play time. I wouldn't let her. Learning to stick stuff out is really important. Sounds like you were strong…just the way a mom needs to be. Being mom is 10 zillion times harder than we ever imagined, isn't it?! You did the right thing. Love and the lesson that sometimes we do what's right, even when it's hard. You not only encouraged her in the lesson, you demonstrated it by doing what was right, even though it hurt you. Carry on, dear friend. You're doing just fine. This broke my heart for her and for you. How DO you find that space?! You did the right thing and so did she. Despite the tears and fears. You did not get angry or threaten. You did not let her quit. You WERE that balance, Nichole. You're already in that space. You are. You are such a wonderful Mom, Nichole. You did what was best for her by pushing her to do what was expected of her but making sure she knew you were her safe place.. So often I think it's in the follow-up, later that day, the next day, that we can soothe over those tough moments. Talking about it out of the moment gives them opportunity to validate their feelings of sadness, anger. But it doesn't make it easier! So hard. Sometimes you give them a soft place to land by teaching them that the are tougher than the things that seem hard. When she is strong, far more places that she may land will feel soft. And that is what you are giving her. Oh poor Katie! You definitely did the right thing for her. I could name a dozen reasons why it was the right thing for her, but you already know them. This post was heartbreaking to read – you did a beautiful job of conveying your daughter's pain as well as your own. But I don't think you give yourself enough credit. I think you found that space between; you struck the perfect balance. And although it hurts both of you right now, one day she will see that and she will thank you for it. I teared up thinking of all of you. It's so hard to be what our children need sometimes. But you did the right thing. Gentle, firm, supportive. That's all you can do. And as parents, we will always question ourselves–that's natural. Oh, this is completely heartbreaking. But, I think you did what needed to be done. She had the commitment, and you made her choose to go through with it (you didn't force her hand, you forced her to make the right choice). You provided encouragement. You provided love. You gave hugs. I hope I'm as wise as you were when I'm confronted with the same. You were just perfect, finding that knife-blade thin edge of loving firmness. And however hard it was for her, I know it was that much harder for you. You did great, Mama. I struggle so with this, tending to give too much comfort, not enough backbone when Ethan just falls apart over things. And then with Jacob, of course, with the autism, it's a whole other ballgame. Also? You wrote about this so beautifully. What a lovely, honest post. I know we've come to expect these from you, just want you to know I'm not taking it for granted. I LOVE that you post all the moments. The ones where our children are being real and we know what we want to do and what's best to do are two different things. You show the human side to children…where many parents pretend their children have zero tough moments. And what I love even more is that you understand the balance…that parenting isn't about making your child's life perfect, but preparing her for life…for the easy moments and the tough moments. Kudos to you and your husband…I think the little girl your are raising will turn into an amazing woman.